never over, no matter how many fat ladies sing." Will Churches be the Next Gun-Free Zones? "Ever since a gunman went on a deadly shooting rampage at a missionary training center in Arvada and a Colorado Springs megachurch, law enforcement and security officials are encountering what they believe is a growing dilemmapeople packing firearms when they go to worship." There is no "dilemma" at all for those who can read and think. The church was New Life Church, about an hour's drive south of where I live. The gunman was Matthew Murray, who killed two people and wounded three others last December 9. Murray was then shot and wounded by Jeanne Assam, an armed security guard. Shortly thereafter, Murray fatally shot himself. I don't get it. Where is this dilemma? Jeanne Assam's cool head and steady finger prevented God knows how much more death and carnage. The tone of the article strongly implies that armed churchgoers are a growing security threat. I am going to quote some passages and interject my own commentary. "John Casey, the former security director at New Life Church in Colorado Springs, where Matthew Murray shot and killed twin sisters in December, said that after the gunfire ended several congregants raced to their vehicles to retrieve firearms. "'It looked like an NRA convention," said Casey, who is president of Paragon Training Group Inc., which consults with churches, Christian schools and daycare centers on security." Why bother having a group to "consult" on "security"? Why not consult with Jesus Christ? These two passages help form the biblical basis of the Second Amendment. (1) The "well-regulated militia" of which it speaks consists of all able-bodied people. This is necessary for the security of not just any old state, but a FREE STATE. Hence, "the right of the people to keep and bear Arms, shall not be infringed." This idea that depriving people of certain tools will prevent evil has no basis in Scripture. It is a false promise. The 20,000 gun lawsi.e. violations of the Second Amendmenton the books in America are based on this false promise. The Bible simply tells us that Cain killed Abel, but not how he did it. Why? Because it doesn't matter what tool he might have used. It was Cain who offed his brother, not some tool. Christians need to know this. However, far too many don't. They are "destroyed for lack of knowledge"Hosea 4:6. And many more will be destroyed if we don't turn things around. When was the last time you heard a sermon on any of this? "Complicating the issue is the fact that many pastoral staffs don't know who among their flock is carrying a concealed weapon, security and law enforcement officials said Thursday during an informational meeting at the Heritage Christian Center in Arapahoe County. (2) The meeting is a prelude to a three-day conference in November hosted by the National Association of Church and School Security." Again, why do Christians need a "national association" to deal with such issues? The Bible tells us what to do. "Casey said it was up to each pastor to adopt a policy on whether church members should be permitted to carry firearms onto church grounds." If pastors want to declare their churches gun-free zones, thus letting their flocks be easy pickings for criminals that is their choice. I would just advise you to leave any such church. "(Casey) suggested that all churches need to somehow find out who among their congregations is bringing a gun to their houses of worship." My guess is that 100 years ago, before we started down this road, bringing a gun to church was far more commonplace than it is now. And nobody shot up any churches. We were an armed society and, hence, a more polite society. Moreover, preachers devoted far less energy to worldly political and social entanglements and had no inhibitions about preaching against sin. Perhaps the reason that you almost never hear, even nowadays, about a church shooting is that churches are not yet gun-free zones? God tells us to learn from history as it does repeat itselfEcclesiastes 1:9. But we don't learn. We took guns out of schools and we got Columbine and numerous other shootings. We took guns off college campuses and we got Virginia Tech. In neither case could any students, staff or faculty shoot back. We took guns out of shopping malls and we got the Salt Lake City mall shooting. It is instructive that, in this case, further bloodshed was prevented only by an off-duty policeman who shot the killer dead. The mall shoppers were disarmed. Imagine a terrorist with a box cutter on 9/11 proclaiming, "My name is Ahmed. I hate you, your freedom and your democracy and I am going to kill you." Now imagine a passenger on that tragic morning whipping out a .357 and saying, as they might in my home state of New Jersey, "Yo, Ahmed. My name is Frankie. And don't call me Francis. Ya want yer 70 virgins? I got yer 70 virgins right here!" Any fool knows that you don't bring a knife to a gun fight. Any fool also knows that when you disarm innocent people, bad things happen. Proverbs 25:26 teaches the righteous not to give way to the wicked. 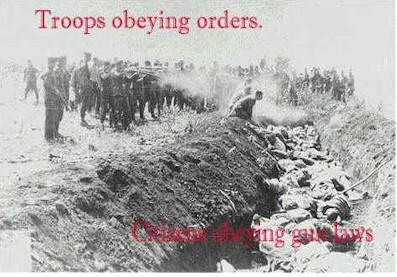 This is exactly what happens when you disarm innocent people. The worst genocides in history have taken place when citizens have been disarmed and thereby rendered defenseless. So what will come out of this November church "security" conference? Will we start to see a push for "gun-free church" legislation? Any church conforming to such a law would be violating the First Commandment. You know, the part about "no other gods before me"Exodus 20:3. "Maybe God is using this obvious assault on the visible forms of so-called contemporary Christianity to separate the wheat from the chaff. Maybe the facade of Christian religion in America is about to be torn down or perhaps re-designed. The Devil certainly has his wicked hand in all this, but I think it's time for professing believers in Christ to think deeply about all this beyond just the 'Devil's attack' mentality. What is God saying to his true church? Maybe it's what the Bible has said all along: 'Come out from among them and be ye separate, saith the Lord!'" For almost a decade, I was very active in a megachurch similar to New Life. I left in 2005 after an extremely nasty, ugly episode. While the devil most clearly had his hand in it, a friend gave me a different perspective. She said that this episode might have been God's way of clearing His people out of there. I believe she was right. Our culture is out of control not because of a lack of laws and policies. But rather, because churches are so obsessed with being like the world and bowing down to the kingdoms of the world that they have forgotten about the Kingdom of God. (1) What Does the Bible Say about Gun Control? by Larry Pratt of Gun Owners of America. (2) Heritage is another megachurch about an eight-minute drive from my house. (3) The best sources for questioning the official story on 9/11 are these three videos. SC in Wyoming sent me the following. I regularly carry my pistol into church services. My pastor knows and has no issue with it. It is kept under my shirt and out of the way. You might have gotten a kick out of yesterday. I preach once and awhile as a fill-in for some of the local pastors when they are off. I could not wear my holster in the normal way, because I dress up a bit when I am at the pulpit. So I did the next best thing, I just put it in my pocket. Worked out just fine. You raise an obvious albeit very easily overlooked point, one which I long surely missedby what method did Cain slay Abel? 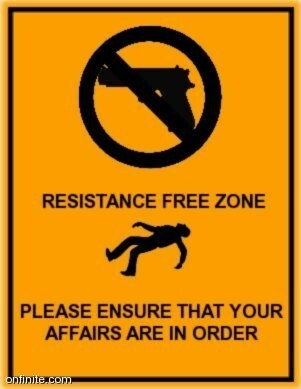 As you note, the tool is irrelevant, yet anti-gunners always harp about the tool and gloss over the criminal behavior. Yes, I surely will link to your article in my upcoming Etherzone piece on firearms. This whole 'gun free zone' gag is just another troubling, ominous relic from the 90s, designed to make people feel good all the while putting them at grave risk. If you would like to post this, please e-mail me and include this URL. Posted at Freedom4um, Novakeo, Covenant News, Rational Review, Cutim, Police State USA and The Price of Liberty.